The basic Teardrop shape is a classic design that has withstood the test of time. It is suitable for almost any hand size and is ergonomically shaped for comfort, balance and control. An average Teardrop shape is 2.25 inches long and .85 inch at its widest diameter. 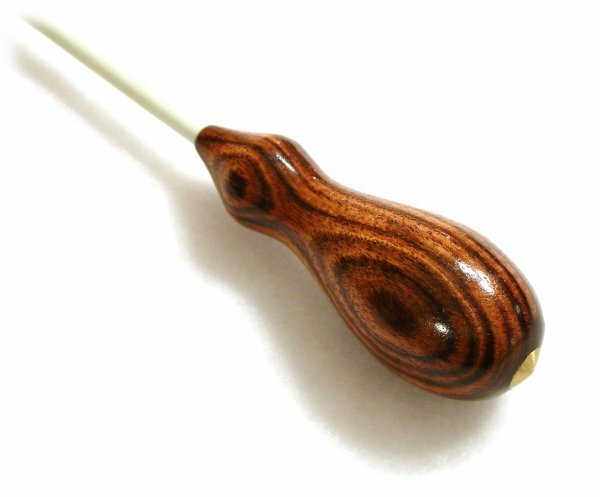 This versatile handle works well with almost any shaft type or length. The Narrow Teardrop is more slender than the classic teardrop and a little bit longer. This allows enough room to comfortably grip the handle with the first, second and ring finger. An average Narrow Teardrop shape is 2.5 inches long and .75 inch at its widest diameter. The Pear shape is similar to the basic teardrop, but is a little shorter and more round. This shape is designed to be held without the use of the ring finger and gives the conductor a wider range of motion in the fingertip gestures. An average Pear shape is 2 inches long and.9 inches at its widest diameter. Due to its smaller size, this handle works best with a light weight graphite or wood shaft, or with a fiberglass shaft and a total baton length of 14 inches or shorter. The Maestro design provides a comfortable, secure grip. The handle is designed to be held with the second finger securely in the “neck” of the handle, the third finger adding stability around the base of the handle and the thumb and first finger controlling the motion of the baton from the front edge of the handle. An average Maestro shape is 2.5 inches long and .85 inch at its widest diameter. This heavy handle is best matched with a fiberglass shaft, or a long graphite shaft with a total baton length of 14 inches or longer. The Tapered Cone shape is 2.25 inches long and .85 inch at its widest diameter. 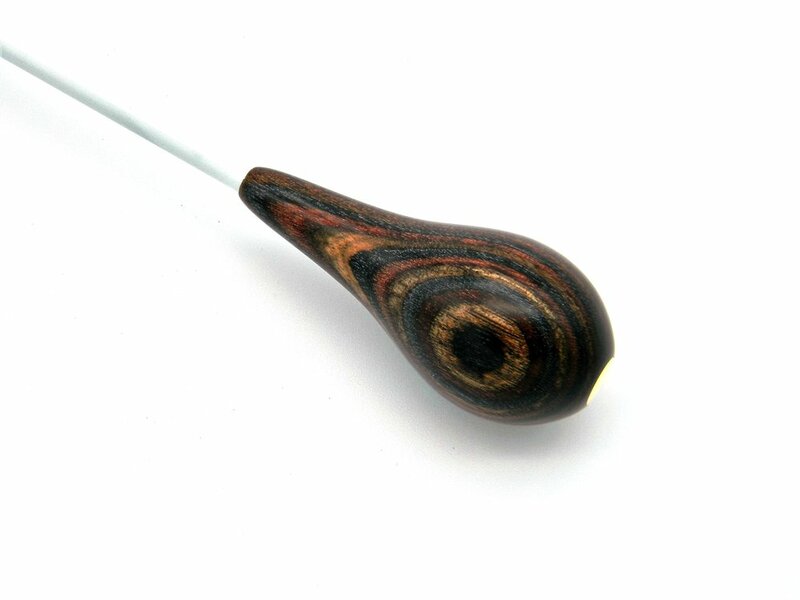 Similar in dimension to the Teardrop, this handle works well with almost any shaft type or length. This handle shape is slightly wider where the middle finger tends to wrap around the handle and fills the hand nicely. The rounded end of the Model T handle gives your 2nd or 3rd finger a secure anchor point while the tapered front portion of the handle gives a comfortable place for your first finger and thumb to control the motion of the baton. An average Model T handle is 2.4 inches long and .9 inch at its widest diameter. This handle is on the heavy side and is best matched with a fiberglass shaft, or a graphite shaft with a total baton length of at least 13 inches.